The current approach to leadership development in most organizations today isn’t working. Organizations must refocus their leadership efforts and shift their mindset from programs to process. 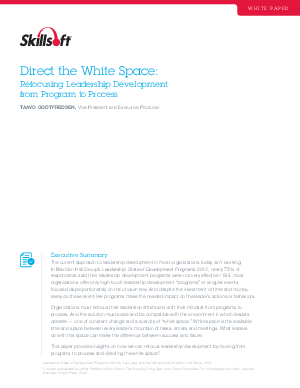 And the solution must scale and be compatible with the environment in which leaders operate — one of constant change and a scarcity of “white space.” White space is the available time and space between every leader’s mountain of tasks, emails and meetings. What leaders do with this space can make the difference between success and failure.